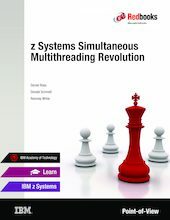 Typical simultaneous multithreading (SMT) implementations allow workloads from different control programs to use a compute core concurrently, but with variable core capacity gains and thread execution slowdowns. The new IBM z13 platform implements SMT differently. At any point in time, a single control program manages the entire core, giving each workload more repeatable core capacity for processing. The z13 has new instrumentation that helps control programs deliver real-time measurements of the SMT-based allocations of core resources. And the z/OS and z/VM control programs use SMT on the z13 to optimize their workloads while providing repeatable metrics for capacity planning and chargeback.